When one first thinks of divorce, often scenes of intense court battles designed to discredit the other spouse come to mind. However, it is possible for some couples to divorce without the stereotypical “War of the Roses” power struggle. In fact, some couples initiate what is known as a “Civilized Divorce”. In a Civilized Divorce, the couple usually agrees upon the terms of the divorce including issues that pertain to property division, spousal support, child support, Conservatorship (custody), and Possession (visitation). These types of divorces are often much simpler, faster, and easier on all parties involved. 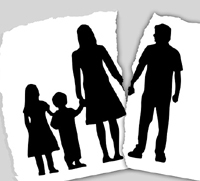 When both parents can agree on the terms of the divorce, studies show that the children fare better then when both parties are at odds against each other and all decisions are left for strangers and the court system to make. It is important to realize that just because a divorce is Civilized, it is still a wise idea to seek legal advice and counsel. More couples are choosing to bypass the counsel of a divorce attorney due to the fact that they are often expensive. However, you can always schedule a free consultation with an attorney and discuss the terms of your Civilized Divorce and hear what the attorney has to say. There are also many divorce attorneys who specialize in Civilized Divorces and they can ensure that you and your spouse have your divorce finalized in the fashion that best meets both of your needs. Sometimes, mediation may be involved in the Civilized Divorce process, but often both parties can reach an agreement without the assistance of a mediator. It is also a good idea to realize that even though you and your spouse will be moving on with your lives, you will always be parents of your children together. Developing a parenting plan that the two of you agree upon is essential to the success and well being of your children. When a couple agrees upon their divorce, yet they need assistance, they may seek the help of a Collaborative Divorce attorney. A Collaborative Divorce is a civilized divorce that includes the assistance of mediators and attorneys that can help both parties reach a peaceful solution. Sometimes, it is possible for Civilized or Collaborative Divorces to become finalized without the need of going to court. However, it is still a wise idea to see the counsel of a divorce attorney that specializes in both Civilized and Collaborative Divorces. One of the greatest benefits of these types of divorces is that the divorce may be finalized very quickly. There is a 60 day waiting period after the divorce has been filed in the state of Texas, however a Civilized or Collaborative Divorce may be finalized in as little as 67 days from the first filing. Whether or not you choose a Civilized or Collaborative Divorce, it is important to realize that at anytime, you may need to have the final divorce orders amended. Yet, you should never enter into an agreement with your spouse on the premise that you can change the orders in the future. By working with your attorney, you can ensure that your Civilized Divorce will best represent your current needs, as well as prepare for any future situations that may arise.